This conference will help professionals develop an effective and efficient water project in order to respond to the changing water infrastructure. This conference includes numerous technical sessions on water treatment research and opportunities to network with industry professionals. The Milwaukee Water Summit will provides attendees with opportunity to network with water technology experts and learn about the newest innovations in the industry. Researchers at the University of South Florida have developed a model that integrates ion exchange process models with life cycle assessment (LCA) and life cycle cost analysis (LCCA). This allows for the assessment of a various design scenarios, where the user can specify particular design characteristics of the IX system, such as the reactor type and hydraulic retention time (HRT), and estimate the environmental impacts and costs of that system. The original model is coded in Matlab. A tool with a user-friendly interface has been created using Matlab’s App Designer that does not require specific coding expertise and does not require expensive software allows for use of the model by the drinking water community. Therefore, the tool is a standalone application that requires no other software for its use. 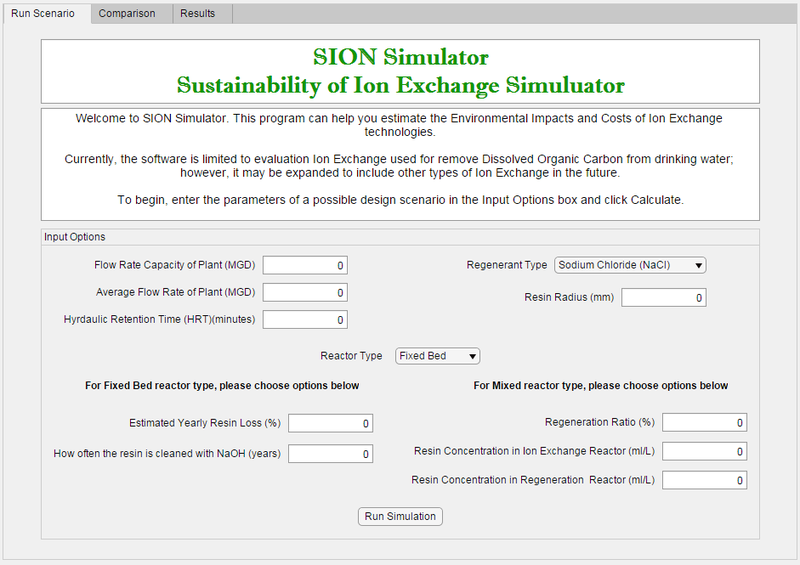 The tool has been named the Sustainability of Ion Exchange Simulator (the SION Simulator) as shown in Figure 1. The tool is currently designed to provide functionality for the code’s main functions, which include assessment of fixed bed reactor (FBR) and completely mixed flow reactor (CMFR) designs of IX systems that remove dissolved organic carbon (DOC). SION includes features such as the ability to evaluate a single scenario or compare two scenarios. It provides a user-friendly interface that is accessible for individuals who have little computer experience. Furthermore, SION provides automatic generation of figures and graphs so that the user can easily interpret the results. SION includes a continually updating database of results of various scenarios. When a given scenario is run by the user, SION checks the database to see if that scenario has been run previously. In some cases, the code can take approximately 30-45 minutes to run a single scenario, but with most scenarios the code will take a few seconds to a few minutes of time. Therefore, the updating database saves the user valuable time so that it does not have to rerun a particular scenario every time the SION software is used. SION’s inputs includes eleven design options, such as reactor type, resin radius, regenerant type, hydraulic retention time (HRT), flow rate capacity of the system, and average flow rate of the system. SION’s outputs include graphs that display the estimated life cycle inventory (LCI) of the operation phase of the IX system, which shows the energy and materials used during the systems operation. Furthermore, figures are generated that show the estimated environmental impact of system scenario and show how much of that impact is attributable to different impact contributors (elements of the LCI). For example, the user can view how much of the impacts are due to salt production, electricity use, and so on. Figures are also created that display various aspects of the costs, including the estimated construction costs as well as the net present value (NPV) of the operation costs, with a breakdown of how much of the operation cost is attributable to different elements of the LCI. Sorg, T., Chen, A., Waml. L., Kolisz, R. 2017. Regenerating an Arsenic Removal Iron-Based Adsorptive Media System, Part 1: The Regeneration Process. Journal-American Water Works Association, 109. doi: 10.5942/jawwa.2017.109.0045. Why it's interesting: This study describes the three step regeneration process of adsorptive media and its effectiveness to remove arsenic and other contaminants from exhaustive media. This process can help small water systems using adsorptive media technology to save costs by reducing the need to replace the media. Bertoch, M., Bergquist, A., Gildert, G., Strathmann, T., Werth, C. 2017. Catalytic Nitrate Removal in a Trickle Bed Reactor: Direct Drinking Water Treatment. Journal-American Water Works Association, 109. doi: 10.5942/jawwa.2017.109.0056. Why it's interesting: This study proposes the usage of Palladium as a catalyst to treat nitrates during water treatment. 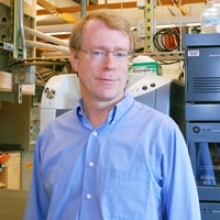 Trickle bed reactors are proposed as the best option to sufficiently provide hydrogen, which is required to reduce nitrates to nitrogen gas and ammonium. J.C.J., Guide, L.C., Rietveld, D., van Halem. 2017. As(III) oxidation by MnO2 during groundwater treatment. Water. Water Research, 111, 41-51. Doi: 10.1016/j.watres.2016.12.041. Why it's interesting: This study aims to determine whether naturally formed manganese oxide on rapid sand filters is responsible for the oxidation of arsenic. The Metropolitan Water Reclamation District of Greater Chicago received the ACEC-IL Honor award for implementing an UV disinfection project at the O'Brian Water Reclamation Plant. The bacteria, Shewanella oneidensis, can be used to treat water containing iron, lead, and mercury, while generating energy. This submerged membrane electro-bioreactor (SMEBR), is an integrated hybrid wastewater treatment unit that is much more efficient at treating wastewater and is less susceptible to fouling. Long Island has pressed the U.S. EPA to set a drinking water standard for 1,4-dioxane, a probable carcinogen found throughout Long Island's drinking water supply, and to invest in a treatment technology for the removal of the carcinogen. Australian companies, Clean TeQ and Ionic Industries, are working together to develop a filtration system utilizing graphene oxide to significantly improve performance and reduce energy consumption.